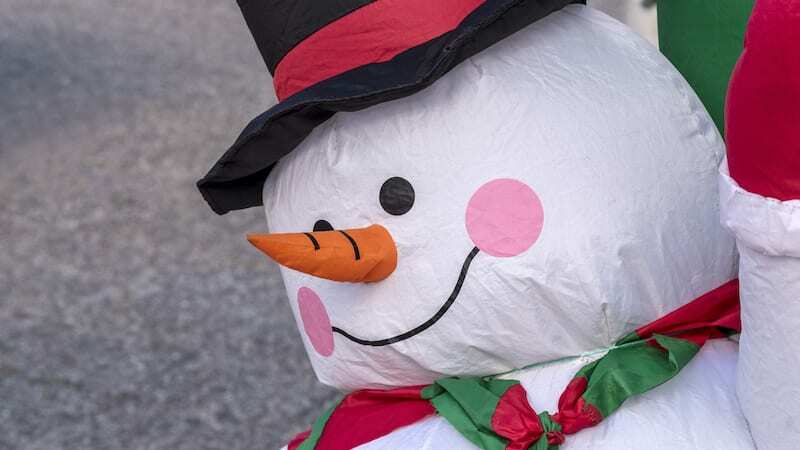 I’m no Scrooge, but you can leave your inflatable Frosty at home. I LOVE Christmas. At this exact moment, I’m sitting next to my Christmas tree, listening to “Hark! The Herald Angels Sing.” My house looks like Frosty the Snowman threw up on a nativity scene. But in my classroom, all you’ll find is a few strings of fairy lights, and those have been there since August. 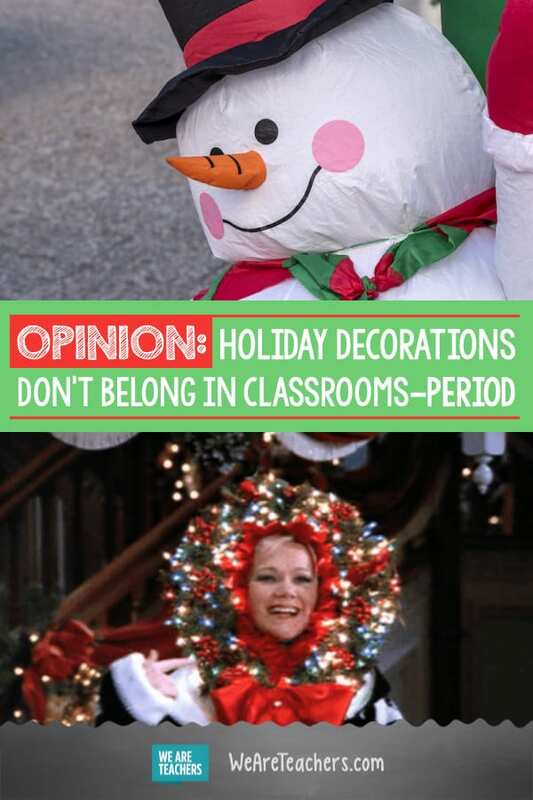 Holiday decorations don’t belong in a public school classroom. Not because I hate fun and joy but for a whole slew of legitimate reasons. 1. Not everyone celebrates Christmas. Sure, I know it won’t hurt your Muslim or Jewish or atheist kids to look at a lovely evergreen tree. But those kids are already bombarded with Christmas decorations and advertising. They’re constantly reminded that their beliefs are not the culturally dominant ones in this country. Also, if you’ve got Jehovah’s Witness kids, then not celebrating Christmas is a pretty big deal in their religion. Your Christmas decorations might actually be infringing on their freedom of religion and will certainly make them feel uncomfortable. 2. You can’t celebrate all holidays in a meaningful way in the classroom. I’m all about teaching kids about world religions. But sticking a menorah next to a big inflatable Santa doesn’t provide a whole lot of nuance. Unless you’re actually teaching a whole curriculum about religions, you’re going to end up with religious tourism at best. You run the risk of sending the message that other holidays are exotic (but inferior) alternatives to Christmas, no matter how much you stress the fact that the Jewish kids get presents for EIGHT DAYS. 3. The holidays are difficult for a lot of kids. Kids who’ve lost family members recently, kids with depression, kids for whom financial need is a constant, kids in foster care or homeless shelters … these kids are all in our classrooms, and they might need a break from the hap, happiest season of all. Incessant reminders that they’re supposed to be merry and bright can make an already hard time even more difficult. 4. If you’re really concerned about bringing some holiday cheer, there are more meaningful ways to do it. Whether you celebrate Christmas, Hanukkah, or Kwanzaa (or all three), you’d probably agree that the meaning of the holiday goes beyond its fake snow and commercial trappings. There’s something in there about helping others and being grateful for what you’ve been given and remembering to pause and be a part of something bigger than yourself. Good news: All that is encouraged in the classroom! Figure out which of your kids won’t have much holiday cheer and work with your counseling department to get presents and food delivered anonymously. Better yet, get your students involved in a service project helping out in their community. My fifth period is doing a bake sale this week and using the proceeds to buy toiletry kits for kids in a youth shelter, which they’ll deliver along with encouraging notes. We won’t need to talk about Christmas for that to be meaningful for my students. 5. And then, of course, there’s the Constitution. The Constitution didn’t “take God out of our schools.” It doesn’t say that kids can’t pray in school, or believe in God, or celebrate Christmas with their friends. The separation of church and state means that we, as official representatives of a public school and as authority figures within that system, can’t lead those prayers, encourage those beliefs, or host those celebrations. Because even if—especially if—most of your students celebrate the same holidays and have the same beliefs that you do, there are some who don’t. And living in a country with freedom of religion means that their beliefs, or lack thereof, have to be protected from infringement by public institutions. Don’t worry; your kids aren’t going to forget it’s Christmas just because you don’t have decorations. They’re still going to celebrate the way they celebrate, but you won’t have to worry about a lawsuit or, worse, excluding a child at a time when they may already feel left out. So this holiday season, I hope you have yourself a merry little Christmas or Hanukkah or Kwanzaa or any other holiday I’m missing. May your days be merry and bright, and may your classroom be standards focused and constitutionally appropriate. Trust me. You’ll thank me when you don’t spend all of second semester vacuuming up glitter. What’s your take on holiday decorations in the classroom? Come and share in our WeAreTeachers HELPLINE group on Facebook. Plus, why winter break is tough for so many of our students.